It’s an exciting time in our home! 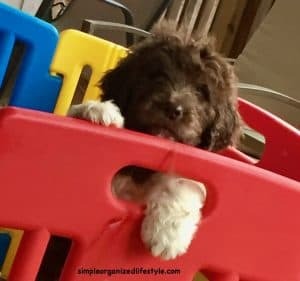 We have welcomed a new member of the family at simple organized lifestyle. A busy little (well, not little for long) bundle of fur baby puppy love! 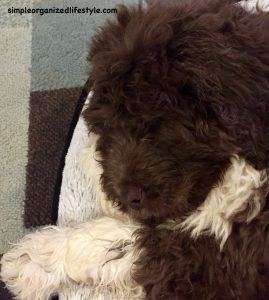 He’s a Newfypoo (Newfoundland and Standard Poodle Mix) who I’ve since found out also goes by Newdle, Newfydoodle, Newfiedoo, Newfoundlandpoo, Newfoundlandoodle, Poofoundland, and Newfoundland-Poodle Mix. That’s way too many oo’s… I think we’ll just stick to Clyde. He will grow to be a big boy, anywhere between 65-95 lbs. He is overflowing with so much cuteness that I’ve already forgiven him for all of the chewing and messy adventures ahead (remind me of that later!) Let the Newfypoo puppy training begin! 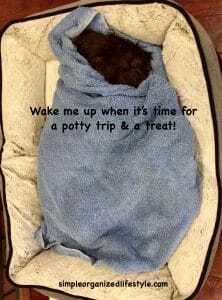 Our Newfypoo puppy training at this point will mostly consist of lots of praise and rewards for good behavior. We’ll start working on some basic commands and just try to get to know what his cues and cries mean. Puppies are full of cuteness but they require a lot of patience for weeks months years! So far, he’s a big eater, plays hard, then stretches out and sleeps hard. He likes to explore but not get too far away from his new family. He likes watching games on Youtube. It didn’t take long to discover his mischievous streak and that a belly rub makes everything better. Pretty much the same as our son (minus the big eater part) so he fits right in! Most of all, this new addition makes us smile. Puppies and dogs are truly a dose of chicken soup for the soul. The truth is I wasn’t really a dog lover until I married one. I have always liked dogs, but kept a healthy distance unless it was a dog I knew really well. It turns out dogs knew when I trusted them and when I didn’t and they returned the feelings. Mr. SimpOL, however, instantly makes friends with every new dog he meets. It was by watching him interact with dogs that I realized I was missing out on how much joy a canine companion can bring. From our experiences, that’s research I believe to be true. Here are some other reasons puppies and dogs do a soul good. More and more, we hear about the positive impact of dogs visiting patients in hospitals, nursing homes and other places where people need a boost. It’s hard to dwell on your current situation with a dog licking your face. Petting a dog can totally make you get lost in a moment and forget about your worries. I know that I’ve come in from a day where everything went wrong to find a tail wagging dog who made me stop and put things in perspective. The next time you have a really bad day, I encourage you to pet your dog and tell him or her about it. I believe if more people did this it would be a much more cost effective form of therapy! I have a co-worker whose dog is her meteorologist. She can tell by where her dog lays and his barks or cries what kind of weather is on the way. She has always said that she will know long before any siren if a tornado is approaching by relying on her accurate meteorologist, Max. A dog is a loyal friend. When we were in the midst of our infertility journey, there was one day in particular that the tears just started flowing. Our golden retriever came over and put her head in my lap and she was just there for me. And it was just what I needed at the time. I can’t leave this article without paying tribute to one of our previous fur babies because protection was his middle name. Our Newfoundland, Charlie, was a truly a gentle giant with an old soul. He watched over his human family and golden retriever best friend day and night. In fact, one night his barking had an unusual pitch to it so Mr. SimpOL went out in the middle of the night to see our neighbor’s huge toolshed on fire. These neighbors are also very special to me as they are my grandparents whom I greatly adore. I called them, waking them and yelling “get out, get away” while Mr. SimpOL called first responders. It was enough time to save their home and most importantly, their lives. Thank you, Charlie. You were one of a kind, puppy & gentle giant. Dogs love their owners even when they don’t deserve it. They don’t even have to use words. They say so with their eyes. I used to work with a Kindergarten teacher who brought one or more dogs to school at least once a week. Kids would read to the dogs, write about the dogs, and do their work because those who finished could go hang out with the dog. I’m not sure who the real teacher was on those days! Any dog lovers out there who would like to add to the reasons they are good for the soul? Chances are just reading this brought back a special memory of a current or former fur baby. As for our new family member, new chapters and adventures await! Right after a nap…..
My husband and I have a Jasper in our lives. He is not quite 8 months old, pushing 90 pounds, and his voice is changing. This Newdle is always happy to help eat some apple, raw green beans, or frozen peas. He is still a galumper, because sleek running isn’t going to happen. He is house trained, knows several commands and hand signals (although whether he chooses to obey them is always up in the air). He loves to play, and still collapses in that puppy heap when tiredness overwhelms him. Now, it is more like a puppy HEAP! His days are busy, and he is a joy. What a wonderful time we are having! Yep, ours sounds very much the same except we haven’t tried the apples or raw green beans- will have to do that. They are busy, playful dogs for sure! Thanks for commenting and enjoy your (big) bundle of joy!!! 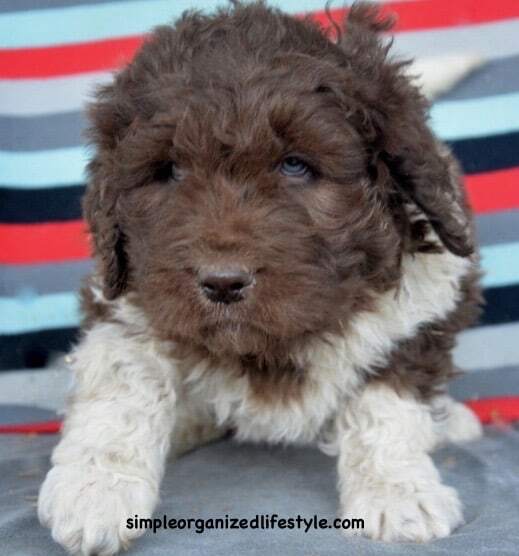 What breeder did your newfypoo come from? I’m looking for a chocolate female. I have gone most of my life without having a dog until 1.5 years ago, when we got our Papillon, We don’t have kids, so she is our baby. Now I can’t imagine how I went so long without having a dog. She makes every day better and is the best therapy. It’s my job to make her life as fabulous as I can, because she does the same for me.